The 1961 New York Yankees season was the 59th season for the team in New York, and its 61st season overall. The team finished with a record of 109–53, eight games ahead of the Detroit Tigers, and won their 26th American League pennant. New York was managed by Ralph Houk. The Yankees played their home games at Yankee Stadium. In the World Series, they defeated the Cincinnati Reds in 5 games. December 14, 1960: Bob Cerv was drafted from the Yankees by the Los Angeles Angels in the 1960 MLB expansion draft. January 16, 1961: Mickey Mantle became the highest-paid baseball player by signing a $75,000 contract. Prior to 1961 season: Art López was signed as an amateur free agent by the Yankees. Prior to 1961 season: Ole Miss Rebels football quarterback Jake Gibbs was signed as an amateur free agent by the Yankees. 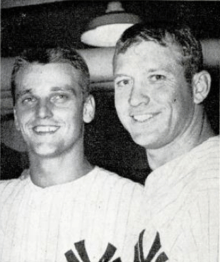 The 1961 season was notable for the race between center fielder Mickey Mantle and right fielder Roger Maris to break Babe Ruth's record of 60 home runs in a season (set in 1927). Maris eventually broke the record, hitting his 61st home run on October 1, the season's final day. During the season, Maris had seven multi-home run games; in a doubleheader against the Chicago White Sox, he hit four home runs. Nineteen sixty-one was an expansion year, with the American League increasing from eight to ten teams, the first expansion in the 61-year history of the league. The old schedule of 154 games (seven opponents multiplied by 22 games apiece) was replaced by 162 games (nine opponents multiplied by 18 games apiece) which led to some controversy due to the eight extra games that Maris had to try to hit 61. Maris' major league record stood for 37 years, three years longer than Ruth's, before it was broken by Mark McGwire of the St. Louis Cardinals in 1998. However, Maris' 61 home runs remains the American League single season record. In addition to the individual exploits of Maris and Mantle, the '61 Yankees hit a major league record 240 home runs. The record stood until 1996 when the Baltimore Orioles, with the added benefit of the designated hitter, hit 257 home runs as a team. In 1961, the American League expanded from eight to ten teams, generally watering down the pitching, but leaving the Yankees pretty much intact. Yankee home runs began to come at a record pace. One famous photograph lined up six 1961 Yankee players, including Mantle, Maris, Yogi Berra, Elston Howard, Johnny Blanchard, and Bill Skowron, under the nickname "Murderers Row", because they hit a combined 207 home runs that year. The title "Murderers Row", originally coined in 1918, had most famously been used to refer to the Yankees side of the late 1920s. The "M&M Boys" together in 1961. As mid-season approached, it seemed quite possible that either Maris or Mantle, or perhaps both, would break Babe Ruth's 34-year-old home run record. Unlike the home run race of 1998, in which the competition between Mark McGwire and Sammy Sosa was given extensive positive media coverage, sportswriters in 1961 began to play the "M&M Boys" against each other, inventing a rivalry where none existed, as Yogi Berra has testified in recent interviews. The 1961 home run race between Maris and Mantle was dramatized in the 2001 film 61*, filmed under the direction of Billy Crystal. May 8, 1961: Lee Thomas, Ryne Duren, and Johnny James was traded by the Yankees to the Los Angeles Angels for Bob Cerv and Tex Clevenger. July 1, 1961: Roy White was signed as an amateur free agent by the Yankees.